Using Drills Appropriately | Mediterra - Swim & Run Better Than Ever! I tried to practice Spear Switch drill. I do this along with two beat kick instead of flutter. When I switch, I don’t see any forward propulsion in my body due to the switch or kick. I do see a propulsion due to the pull action of my lead arm. I really don’t know what I am missing. It’s a good drill and this swimmer is doing a great job using it integrate various parts of his stroke – the switch in front with the kick in back. His comment shows that is expecting forward movement, assuming this is what the activity is meant to produce when done correctly. Keep in mind that drills have a limit to their utility according to how they are setup, while they also have flexibility in how they can be used. We can use one drill for possibly many different purposes like diagnosing strengths/weakness not just improving skills. But we must be careful to understand that specific purpose and set expectations for it accordingly. Arranged in a certain way a drill will allow the swimmer to ‘slow down time’ and ‘focus more easily’ on a certain part of the stroke in order to increase awareness and/or increase control. In many of the standard drills you are familiar with in Total Immersion the drilling activity will not achieve the full range of effects and sensations one should have in the whole stroke action, but only one or a few specific parts of it. 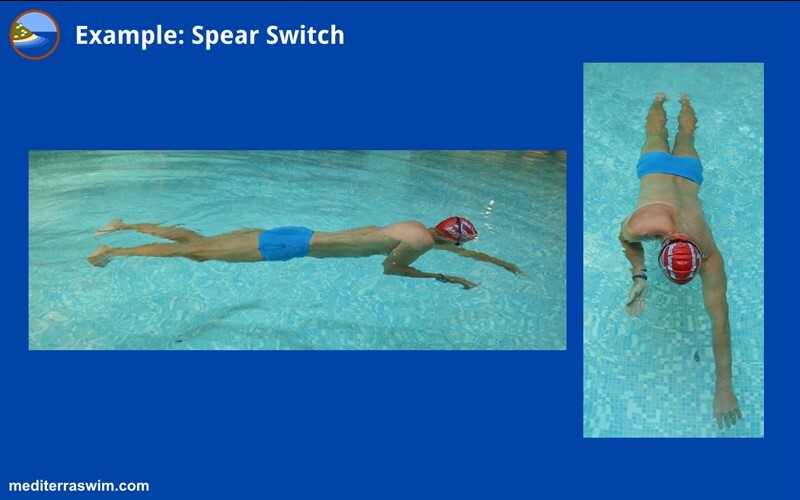 In the case of using Spear Switch, as this swimmer described, its purpose is to help you establish switch timing and train the arms to work independently but cooperatively, each getting into position and doing their job at the right moment. And, as you have been doing, it can be used also to help feel the timing of the kick. But, without repetitive strokes to create momentum, you are pushing against the inertia of still water and you won’t move ahead easily. The purpose of this drill in this case is to become sensitive to timing in this stable position, not for creating propulsion. If that happens or not is not important. The underwater switching arm in Spear Switch situation creates a lot of drag so it works against most of the forward propulsion the gentle catch and gentle rotation create. And if you try to abruptly pull and/or abruptly kick in this drill to create some satisfying movement, then you may actually start working against the greater benefits of this drill – timing and steady, smooth pressure (of catch and kick). One more thing – keep in mind that the 2-Beat Kick has very little value for forward thrust. It’s purpose is to assist rotation by pressing on the water in a torquing manner, not push back on the water to thrust the body forward. So, the 2-Beat Kick, done well (or at least in the way I practice and teach it) should actually not push you by itself. It only works to accentuate the torso rotation. Now, with that said, we need to keep the big picture in mind – becoming good at doing a certain drills is not the goal, rather integrating that skill into whole stroke and making full use of it is the goal. Even though a swimmer discovers the need to spend a lot more time doing some drills, why do so and how much should he do? This comment topic coincides well with the previous post Correction vs. Over-Correction. That was helpful. I too, sometimes get caught up in trying to maximize forward motion in a drill. The other end of the pool seems to be beckoning. Hearing the same message, but in a different way, helps it sink in. Hi Isaac. I too think about it and try to explain it from different angles like this in order to meet swimmers coming at it from different directions. Glad it is deepening your understanding. Yes, the wall has a powerful pull on all of us. I too have to really resist it in the pool. Hi Matt. Today is your lucky day. My initial reply got lost because I forgot to type in my info prior to sending. So my new reply is much shorter. What do you make of the assertion that shoulder rotation generates some propulsion: the swimmer is kind of screwing through the water medium. Some coaches (even a TI one )have drills where they make the student just rotate the shoulder like a propeller without engaging the arms. Hi Lloyd! I can’t complain about any long comments since you all bear with my long essays! Mass is required for creating momentum and once that momentum is going and perpetuated, we get swimming advantage from it. The torso is the great mass we need to leverage for the stroke, otherwise what is left? The small shoulder muscles. In theory, it is easy to agree that the torso rotation should empower the stroke, but there are more and there are less effective ways to leverage the torso rotation. In TI we propose a particular way of tapping into that and sparing the smaller shoulder muscle group for a shape-supporting role. Yes, there is a corkscrew kind of effect we are aiming for with synchronized parts of the body. In physics it is called ‘precession’ which means taking a force from one direction and translating it into a perpendicular direction, which is what a corkscrew does through its rigid structure. We have to create that same effect with articulating structure. But I would choose to rephrase that to ‘torso’ rotation rather than ‘shoulder’ rotation, because it may lead someone to rotate just the upper chest, not the hips also. If one disconnects the hips from the shoulders (as is required in how most people perform their 6-beat kick) then you cannot use the torso to empower the catch/hold (pull/push in traditional terms), you can only use the smaller shoulder muscle group. You force a 2-motor stroke instead of the single synchronized full-body stroke we emphasize in TI. (6 beat kick has its place but much more limited than most people presume). With this precession concept in mind, another mistake swimmers make is thinking of driving the hip rotation downward, rather than forward. Hence, another possible cause of over-rotation. A force-forward-orientation helps channel the movements forward rather than downward. When one rotates the hips with the intent of driving the extending arm forward, it creates a subtle but profound difference in the way rotation is carried out. One does not then want to rotate too far downward because this actually hinders the extending arm (causing it to swing inward toward the spine line), rather than accentuate it further forward. A forward driving hip will only rotate about 30 degree up/downward, and the shoulder rotation should correspond with that, of course, if they are truly connected. However, with the hip/shoulder connection firmly established, the swimmer can focus on just the shoulder component or just the hip component in connection to the extending arm (an example from what I call ‘sync practice’) and discover and improve fine details in their relationship. When isolating any part of the body or stroke for a drill (like the one you mention at the end of your comment) it only has value if it’s connective purpose to the rest of the body parts and stroke pattern is clearly understood and practiced as the next step in the drill. I think I speak for all diligent students of swimming, your posts are very informative, succinct and articulate. No one has to “bear” with your “essays”. They are a wealth of valuable knowledge from the perspiration of experience. Speaking of using drills, my long narrow and dense torso precluded from doing extensive skating drills: would sink while rotating to breath. Eventually, a snorkel was recommended. The impact has been tremendous. Especially, when I switch to my swimming after the drill. However, I notice a “feel” that wears off after swimming some time. So I will keep doing more to drill in the drill. Thanks for this particular blog post: I was able to cross reference your June 2012 SAG article. My SPL is stuck at 15 to 16 range and that for 25 yds not meters. For my height of 6ft 3 inches that’s less than optimal. Have watched that Shinji video countless times mining for tips. Not to diminish his feats, I did find out that his wingspan is comparable to Terry’s. So the water sees him as being 6 ft tall. Also coupled with his shorter legs allows him to get away with a slightly longer stroke length. Will be making your steady-catch suggestion a priority. I suspect the gift is more propulsion. I think my form is decent, but really need to work on lowering wave resistance. I stand corrected and actually meant to say torso rotation earlier. I always see them as together. Thanks. Hey Lloyd, thanks for the encouragement on the blog posts. It is born out of a passion of my own learning. I am just continually fascinated by everything and the further I go the more fascinating it becomes. We really have no idea all there is to learn… and I leave the statement completely open-ended. And there is simply the profound pleasure of study and discovery itself. You have felt some thrilling sensations (great!!!) that wear off at some point (bummer!). It could be a from some attention fatigue, but there could be muscular and metabolic causes too. There are also layers to the ‘magic’. You may be thrilled by the results you get when finally establishing features on the foundation layer, but eventually you’ll find there is more deeper down. By reading your brief description, without viewing myself I cannot tell whether your current boundary is caused by a weakness in some fundamental piece, or if there is some deeper layer skill that you are now becoming sensitive to and you realize you should now expect. Keep an even closer eye on protecting your frame (your shape, or that static, stable frame your movements and force transmission are dependent on) when you get near that failure point to see if some fundamental shape feature degrades. Then consider weaknesses in the next layer ‘precision of each moving part’ (which will address some of that wave drag), and then consider weaknesses in the next layer ‘synchronization of moving parts’ (which will address force transmission and more of that wave drag). Yeah, you pointed out a significant body dimension advantage Shinji has – a longer wing:height ratio. He is shorter than me, yet easily strokes longer with those much longer arms. On the best tuned up day I can barely manage 10 SPL under similar test conditions compared to his 9 that he makes look easy. He has the wings, bigger feet and hands as a serious advantage. We work with what we are born with. And yes, you are entitled to a much longer SL at 6’3″! So, keep up the good investigation to find those obstacles on the various levels you are aware of at this point. Saw one of the life guards (6ft) at my pool swimming. Measured his SPL to be 11. At my concern, he stated that I have muscular limitations. To his comment, It is my observation that the human body modifies itself to any physical endeavour. For instance lifting weight will make you muscular. But most expert swimmers look less dense from their years of swimming. Does the water hate musclarity? Do I have excessive frictional resistance, stemming from high density, precluding me from gliding through a longer distance? It is harder to push a heavier body along a surface. Even more so, when you press down on it. I may have found my limitation. However, I will keep up with the drills. I love swimming. I like that description of setting the catch in ‘vaseline’. Really good image. I might need to borrow that one. Keep in mind that we’re after an optimal stroke length that is suitable to your body and suitable to the kind of swimming you are training for. 11 SPL is commendable as a gymnastic trick (I can do it, even with much shorter wingspan) but it is not suitable for most cruising or racing. Sun Yang would be using around 13 SPL at his 1500 WR pace, just to give some reference point, and he is a tall dude. Every ‘expert’ on swimming is going to scan your situation and hopefully give you some useful advice or consideration from his perspective in that moment, but consider the context and limitations we each have. You will be the expert on your own body, at the end of the day. It may be that you need more improvement in #4, but without the other parts in up to par to support that power supply you will have a lot of power-leakage. Power generation, in swimming, needs to be built in conjunction with the power delivery systems because you cannot train one without training the other. Maybe he felt your other parts were looking good and this is the missing piece. Competitive swimming conditioning is a individualized balance between shape and power. We work on shape first (build the circuits) and add power second (send signals through the circuits) so that you stand a much better chance of establishing a truly efficient stroke pattern. For sinkers one needs to solve the biggest part of the physics puzzle with superior shaping, leveraging natural forces rather than working against them with brute strength because the natural forces will win and wear him out. So, first learn how to get your body near the surface through shaping and directing the flow of water strategically, so that very little power needs to be diverted toward vertical work, and instead most of it can be applied to forward motion. Does your density cause you problems? Not in an absolute sense. Attack submarines are extremely dense but they are designed to slide through the water very efficiently (as indicated by their silence and duration). Shaping your body better is still the first the key to your problem, not power. The water does not hate muscularity (power), it just punishes the swimmer who wastes his power. Don’t look too carefully at pro swimmers because their shape may be as much a matter of natural sports selection process as it is a result of their training. It’s called the ‘Swimmers Body’ myth. You’ve got what you’ve got to work with and teaching your body a better relationship with the water will cause your body to respond and some observable attributes will change. I just had a large body builder at a workshop in Italy last month and he set a new standard for what I will expect of big, muscular dense-body swimmers (even who are new to swimming). I saw more living proof that technique done well even in an unlikely body style can produce beautiful smooth swimming. I may have overparaphased his comment to shorten mine. Over the course of the last year he had seen me practicing and swimming. It was actually to astonishment at him swimming for the first time and dismay for my current SPL that he commented. He really said to take into consideration my muscularity and the “length” of time I had been swimming (1 year) on gauging my SPL: he had been swimming all his life. I am grateful for your bodybuilder ancedote. The submarine analogy really drives away any residual recalcitrance I have regarding density issues. The founder of NLP, an excellence discipline I subscribed to years ago, said that to succeed in change, you have to get to a point where the difference between what you want and are currently doing or getting becomes extremely distinct. I say this because I am starting to notice how in TI and swimming, as you get deeper or push on, every focal point becomes a universe of its own with galaxies sub-focal points. Initially, I told myself that as soon as I learned to swim “decently” and have an SPL of 17, I would end my “learning”. Then it was swimming for a mile endlessly. Now that I am getting closer to achieving the latter, I am starting say at 10, I will delete my TI web links. Thanks and cheers Matt!